Chœur du Théâtre des Champs-Elysées, Philharmonia Orchestra / Jérémie Rhorer. Stage director – Olivier Py. Théâtre des Champs-Elysées, Paris. Sunday, December 15th, 2013. This was the last leg in a three-city, four opera marathon where all the shows were in some way exceptional. On paper this Dialogues des Carmélites had an incredible cast and it takes a truly special show to live up to its expectations. This show most certainly did. It seems to be that the casting director at the Théâtre des Champs-Elysées sat down and came up with a list of some of the finest francophone singers operating today and engaged them. What really made this such a special show was that the diction was by and large exemplary which meant that the drama came alive in the way that opera in the vernacular can. Sandrine Piau withdrew and she was replaced by the sensational talent of Sabine Devieilhe. I’ve heard great things about Devieilhe and she more than fulfilled her promise. Her Soeur Constance was sung with an incredibly clear liquid tone and a sweetness and ease on the top which was beguiling. The voice is a nice size and carried well in the theatre. Sophie Koch’s Mère Marie was a dramatic tour de force. The slightly abrasive tone was certainly in keeping with her character. Her honest and warm singing had great presence and a terrific top. Patricia Petibon was also superb as Blanche. The voice seems to have gained a wider range of colours in recent years and her singing was by and large very disciplined. Her closing lines were shattering. Rosalind Plowright dominated the stage in act 1 as Mme de Croissy. It wasn’t always beautiful singing but it was completely mesmerizing and the voice came across as large and rich. Then there was Véronique Gens. If there is a finer Mme Lidoine anywhere, I would be amazed. She was quite simply perfect. The warmth of tone, ease of line, clarity of diction – everything was there and more. There was a strength to her characterization that was incredibly moving. She must be in her absolute prime right now. I would say that this is the best I have ever heard her sing. The gentlemen were very good without being incredibly memorable. Topi Lehtipuu had a tendency to pronounce ‘peur’ as ‘père’ which was somewhat distracting but his singing was wonderfully fluent and easy. Philippe Rouillon’s Marquis was a tower of strength. Supporting roles were well taken especially Jérémy Duffau’s premier commissaire. 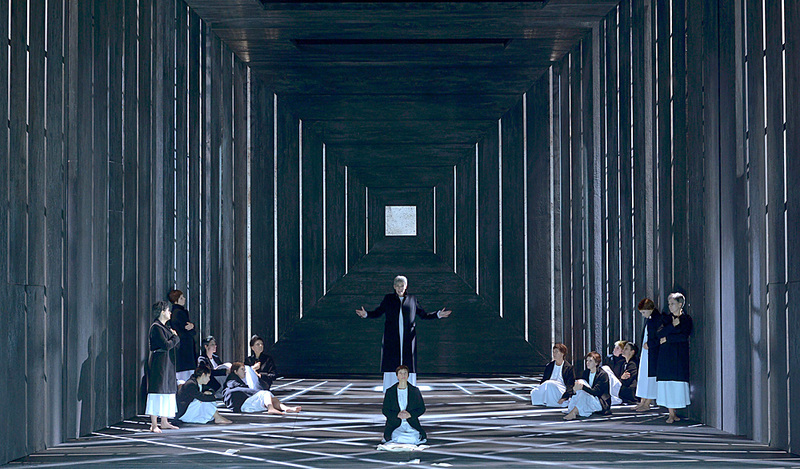 Olivier Py’s staging was suitably austere and offered a remarkable framework for the drama. Some elements of the Personenregie didn’t quite convince. I don’t really want to discuss them because I think in doing so might draw undue attention to them and possibly ruin the enjoyment of anyone who is going to see it or will be seeing the internet live stream. Lighting (Bertrand Killy) was extremely effective, especially in the prison scene and final scene. To an atheist of a non-Catholic background I think I – inevitably – missed out on some of the subtleties and meaning of the imagery. Py’s vision of the work was, at one with Poulenc’s, a very Catholic rather than a humanist one. That is not to say that the show lacked humanity – certainly not – but it was very much rooted in the Catholicism deeply embedded in the work. Mme de Croissy’s death scene was spectacularly staged, her bed on the back wall of the set which gave Plowright the opportunity to full inhabit and express the character. I could write more about the staging but as I mentioned, I really don’t want to ruin anyone’s experience of seeing it for the first time. I realize that I haven’t yet mentioned the contribution of the Philharmonia who were superb form with playing of great expressiveness and virtuosity. To say that it was a great accompaniment to what was happening on stage risks diminishing the value of their contribution but it indeed perfectly matched the events on stage. Jérémie Rhorer’s conducting was lyrical and broad yet also offered violence and precision where necessary. It was very well paced. The show will be streamed on the Théâtre des Champs-Elysées’s website on December 21st and I recommend that anyone who loves great singing, French music and these wonderful artists watch it. Outstanding.